"My Father, help me to form, with the help of my children, a new and humble people." The allure of St. Francis is not limited to Catholics, for he is correctly called "the people's saint." Many artists have tried to capture this great man's persona, some successfully and others not. In the medium of film, Michael Curtiz's glamorous Francis of Assisi is a faithful account of his life and Franco Zeffirelli's Brother Sun, Sister Moon is a loving tale of his spirituality. I admire these films greatly, finding tremendous strength in each of them despite their flaws. 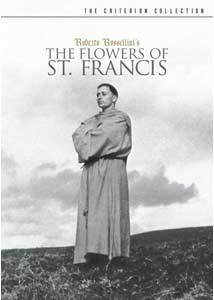 Now I have just seen Roberto Rossellini's The Flowers of St. Francis (Francesco, giullare di Dio) and again the life and message of Francis is sublime, touching my Catholic sensibilities deeply. Of all the different films about St. Francis this is probably the best and, yet, somehow I still don't quite feel like I understand it or know what I think of it. It defies all my expectations, though this is part of its strength. The opening shot of Francis and his fellow Franciscan brothers is quintessential Italian neorealism, depicting mud and a bitter, cold rain to cement the film in the harsh reality of the Middle Ages. The narrative is loosely constructed of ten episodes depicting the Franciscan Order's inauguration. Having received permission from Pope Innocent III, Francis and his brothers return to Rivotorto and build a church. In Rossellini's telling, Francis (as portrayed by Franciscan Brother Nazario Gerardi) is saintly, but not yet a saint. He and the other monks exhibit what one might call naïveté, but perhaps it is a blissful joy in God's creation. The film's strength is not in the events depicted on screen, per se. Rather, it seems to be in the aura of Francis' early ministry that Rossellini's direction evokes. The peaceful existence of Francis and his brothers is transcendental, touching the audience and inviting us to partake in the Franciscan Order. Francis is not shown as the central figure, but rather as merely one of the monks. Each monk has an important role in the church, but the film chooses to focus intently on two brothers. Brother Ginepro (Brother Severino Pisacane) is a well-intended man desperate to preach, but relegated to cooking. Brother Giovanni (Esposito Bonaventura) is a local simpleton who joins Francis' ministry, hardly understanding the essence of Francis' ideas. I find these two monks to be interesting, though one may rightly criticize Rossellini and his co-screenwriters, most notably Federico Fellini, of meandering. There does not seem to be enough of Francis in the movie. That was my initial reaction, but the more I've thought about The Flowers of St. Francis (incidentally, the proper translation of the title is "Francis, God's Jester") the more I think I am beginning to understand what Rossellini was trying to convey. This is not meant to be a film of Francis' life or his complex personality, but rather about the humility of his spirit. Even though Francis is shown as nothing more than one of the monks, this is essential to showing his submission to higher powers. His spirituality is what drives the film, creating a particularly touching scene when Francis happens upon a leper one night while praying in the woods. Not a single word is spoken, leaving it open to a tremendous amount of interpretation. Why does Francis weep after the leper walks away from him? I don't have the answer, nor do I suspect does Rossellini. This is not a tale that wishes to explain its subject, but merely to bear witness. With gorgeous cinematography that evokes the great paintings of Francis' times, Rossellini employs minimalism effectively as a means of conveying the simplicity of Franciscan devotion. There's an extended sequence in which Brother Ginepro is finally allowed to preach and unwittingly finds himself nearly murdered by the barbarian Nicolaio the Tyrant (Aldo Fabrizi). This seems to be the heart of the film, with Ginepro learning the true purpose behind Francis' mission and, ultimately, Christianity. It also serves as a glorious depiction of Franciscan self-sacrifice in contrast to the world's rampant materialism. Fabrizi's Nicolaio is the only character performed by a professional actor and the performance exudes extravagance, while the quiet power of non-actor Brother Severino's Ginepro instills a sense of awe and mystery. It is truly an astonishing sequence, one that demands repeated viewings. It has occurred to me that I am not truly offering a satisfying review of The Flowers of St. Francis. Perhaps it is not meant to be reviewed, merely experienced. While viewing it, I wish I saw more of St. Francis. After finishing it and while writing this piece, I think that I saw plenty of St. Francis without even realizing it. His spirit occupies every frame, as evident by the humble filmmaking and the spiritual performances by real Franciscans. There are many flowers thanks to St. Francis; Rossellini's film is one of them. Image Transfer Review: The 1.33:1 black-and-white transfer looks extremely good, with only some occasional print defects. Shots that contain a dissolve go out of focus, though this is probably a flaw in the original print. Contrast is very good and blacks are richly textured, with detail also deserving high remarks (you can practically feel the itch of those tunics). Audio Transfer Review: The Italian monaural audio mix preserves the original theatrical presentation quite well and is very crisp. Some hiss can be detected, but it is minimal. The scene in which Brother Ginepro attempts to speak over the roar of a waterfall is quite effective. Insert—a 36-page booklet containing an essay by film scholar Peter Brunette, a letter from director Roberto Rossellini, an excerpt of a letter by film critic André Bazin, a note on the film's different versions, and an excerpt from a Rossellini interview. Interviews—separate video interviews with actress Isabella Rossellini, film historian Adriano Aprà, and film critic Father Virgilio Fantuzzi, SJ. English Prologue—the opening used during the film's initial US theatrical run. Extras Review: The supplemental material begins with a 36-page booklet. Containing many, many writings, this is a wonderful introduction to the film for those unfamiliar with it. Film scholar Peter Brunette's God's Jester puts the film in the context of Rossellini's life at the time. Brunette's essay added a new dimension to the film for me, thanks to his thorough and thoughtful analysis. Following that is The Message of The Flowers of St. Francis by Roberto Rossellini. He is very candid about his reasons and designs for the film, though the writing is quite brief and somewhat superficial. After this A Note on the Film Versions explains the alternate opening that screened at its premiere and mentions the reaction to the film at that time. The most interesting part of the insert comes from the great film critic, André Bazin. His letter In Defense of Rossellini is excerpted, touching upon the career of the director and arguing against the claims that Rossellini does not truly exhibit the neorealism style and it is still an excellent bit of writing. The final component in the booklet is Oh, Rose!—The Franciscans. It is an interview between Rossellini and Victoria Schultz from 1971, covering various aspects of the production. All of these articles make for an excellent booklet. Special features on the disc itself consist of three interviews and an alternate opening scene. Notes on My Father: An Interview with Isabella Rossellini (16m:02s) is an interview with the actress, who is Roberto Rossellini's daughter with Ingrid Bergman. She talks about her father's approach to telling Francis' life, as well as his own religiosity and views on the cinema. It's an engrossing account of her father, with some keen insights. The second interview, Adriano Aprá on The Flowers of St. Francis (18m:07s), talks about how the film represented peace to Rossellini in a time of chaos. He also discusses the collaboration between Rossellini and Fellini and says there is a missing scene about a prostitute. Aprá uses his background as a film historian to chronicle the film's perception over the years. The third interview, My Conversations with Rossellini: An Interview with Film Critic Father Virgilio Fantuzzi, SJ (11m:45s), is my personal favorite. He discusses his impressions of Rossellini from having met him and gives a religious analysis of the work. One particular passage that I found interesting is when he talks about the reaction to the film by the clergy. All three interviews are quite good. The final extra is the English Prologue (06m:12s), the opening from the American release of the film. The credits and narration are in English, with various religious paintings of the period in the background. Supposedly, this is somewhat similar to the prologue that ran with the film when it appeared at the Venice Film Festival in 1950. It is nice to see this alternate opening to the film, though I'm glad it is included as a special feature and not placed on the film proper. The Flowers of St. Francis (Francesco, giullare di Dio) contains an undeniable presence, though I am not quite able to decipher what it is. The Criterion Collection once again triumphs with this DVD release, bringing a classic film to new life with a wonderful restoration and excellent special features.